The sun was pouring into the east sky, scattering orange like a blanket over everything. She was sitting in the front seat, unable or unwilling to look at me, her head turned decidedly away and her body clinging to her side of the car sending its message loud and clear. Was there a tear in the corner of her eye? I don’t know because I was too angry to ask. We were on our way to a rare social gathering and I just needed her to get over herself already. What I was really thinking is that I wanted her to show my friends how well homeschooling was working out, how smart and well adjusted she was, how pleasant and kind to be around—all of which would translate into some imaginary points for me. What I didn’t want was for her to sulk through the whole thing and make me look bad. And we were running out of time, because we were almost there and neither of us seemed capable of moving toward reconciliation. Why was she even sulking? I couldn’t for the life of me figure it out and I was too stubborn to ask—maybe too afraid that I had done something to cause it. So, I lost my patience and basically demanded that she play the part. I didn’t yell but I was harsh. I bulldozed right through the situation and got what I wanted. It wasn’t my best parenting moment. We walked in and she pulled herself together. She was perfectly behaved. She was engaging and courteous. But, she was hurt and probably only I could tell. It didn’t take long for my heart to soften and the guilt to set in. I wondered to myself at what price had I wrangled her obedience. I thought back to times in my own life when I knew I was being valued for my performance, by what good I could bring to the table and I felt the sting of doing the same thing to this person I supposedly loved with all my heart. When she climbed back into the car, we had a long talk about what had happened. I apologized for being harsh, for demanding results. She explained why she was upset and then apologized for the sulking. It was pretty simple, in retrospect. We are sinners who fail each other everyday. The magic is in being willing to fess up to all the ways we hurt ones we love most. She just wanted to be heard and understood. But she didn’t know how to ask for it and I was too full of my own selfish expectations to even ask. Parenting by law or by sheer will will often get us the results we want but those results won’t endure because they will begin a long and slow fracture of the heart. Just like in our spiritual life, the law requires us to be a certain way, to follow certain rules, but it does nothing to win our hearts. Only love can do that. The law requires but love inspires. The law kills but love makes alive. The law leaves us empty, despairing at all the ways we never measure up. Love fills us to overflowing, and the overflow seeps out to everyone in our wake. Often the end result is the same, so we assume that because we got the right result or the appropriate behavior, we must be going about it the right way. But a lifetime of living (or parenting) by the letter of the law—for results— will bankrupt us and our kids and leave them snatching and striving for approval and love. Maybe we just forget what the end game is. Or maybe we parent from fear or pride or the approval of others. Or maybe we have so longed lived without unconditional love ourselves that we can’t help but pass our wounds on to our kids. Do we just want to manipulate them into a set of forced right actions or do we hope that they are so well loved that that love ignites a fire in them to love and serve others well? They learn what they live, no matter how loud we talk. In other words, we’ve been given the impossible task of teaching them what it means to really love someone. And for that, there is no shortcut—only a lifetime of living it out in the everyday mundane trenches of ordinary life, mostly confessing how painfully we fail at doing the one thing we had hoped to do well. It never fails. Even when we do. Perhaps especially then. Lean in close, dear mama. You are beloved by your Father. You don’t need to do anything to measure up or earn His favor. He is for you and with you and you are His. He is your warrior God who went to a cross to fight off your demons, who died to give you life, who wages war on hell everyday for you—to keep you safe and in His blessed fold. He is your Good Shepherd—the one who leaves the 99 to find the one lost lamb. You are never alone. In Christ, you are loved with an everlasting love. In Christ, you are home. This podcast might help, too. All my love to you, friends. thank you for sharing from your heart once again. i needed to read this. I’m not a mother, but I so needed to read this today. Especially that last bit. Thank you, Edie, for sharing your heart and these words of encouragement. ok i admit it… you have me literally bawling! i so need to be reminded of this.. especially right now when the old hurts are resurfacing… why do they seem to resurface when we are at our weakest? maybe its because we’ve been trying to hold things together instead of just going to our Abba father letting HIM hold us, wipe away the tears and fears, and just resting in HIM. So thank you! thank you for allowing the Lord to work in you and through you! Thank you for sharing these words of encouragement! Wow, Edie. This touched my heart and rang so true. Like, so true that I’m a bit freaked out at being reminded of what kind of parent I want to be versus the kind of parent I was this morning trying to get the kiddos ready for school. Thank you. I needed this. It’s amazing to me how much humility and the sheer quantity of time it takes to do even the least bit of parenting. Thank you so much for this reminder of the value of both. Oh goodness! The situation with your daughter? Been there, done that, bought the shirt. Thank you for sharing. I love everything about this post. I have never seen this put into words before and I can’t tell you how eye opening this is. Lord, don’t let me forget! I’ve printed quotes to hang about my kitchen as a reminder. You are a blessing, Edie. You could insert my name here…sadly. It’s amazing how your words can speak right to my heart. I’m just sitting here crying wanting to accept it as truth, needing to accept it but still having trouble. I wasn’t raised in a church with a belief in Jesus as Christ. I’ve been searching for meaning for as long as I can remember and even more so since I had kids. I try so hard to be a good person, a good wife and mother. To serve my neighbors. I want my kids to feel loved and to learn about God and to have a strong belief in something bigger than themselves. It’s hard to teach what I don’t know for myself. I don’t want to pretend and profess to know something when there’s always quiet doubts. But no matter what, it truly is about LOVE. Love is the answer. You’ve been such an inspiration to me over the years. You’ve helped me so much on my faith journey. Thank you, thank you, thank you! Much love. I get more from you than C.S. Lewis or any church I’ve gone to. Preach it sister. I’m so glad you are here. And we all doubt, Tomi. Bless you, friend. I am homeschooling two daughters on the cusp of regular hormonal crazy, them and me 😉 I was raised to behave, no one thought to seek and keep my heart. It is hard work to not be the parent yours were. This is a lovely, honest post Edie. Thank you! Thank you so much for sharing, Kelly. Yes. This. You explain it so well. Sometimes I’m not even aware of what I’m doing. Then I see his sad expression and realize it’s not always about rules and keeping them. i needed this. Thank you…..thank you for your obedience in helping me see Jesus in my everyday struggles. Your words of encouragement are so precious to me…. You hit me right between the eyes, girl. Thank you! What a wonderful supplement your comments are to a book I just read – You Are Loved. I love how God reiterates the lessons he teaches us. I am new to your site/podcasts and I am so enjoying your work. You’re like finding an old friend – maybe because we have the same Father. Welcome, Melinda! So glad you are here. Hello! I just found your blog while searching to read some encouragement for homeschooling. I’ve read a couple of your posts and they did bring a lot of encouragement, thank you! Sometimes it’s just so good to know we don’t struggle alone. This is post was very sweet and I have often experienced similar feelings with my kids and forgiveness is amazing. Such a gift. I did want to encourage you though to search the scriptures about the law of God now through Christ bringing freedom! The law before Christ was to show us that we cannot do it on our own, we will never be good enough. But when Christ came he didn’t do away with the law, He fulfilled it! It’s a newer revelation to me and brings such comfort and joy. It also makes a lot of sense in how much King David LOVED God’s law. Psalm 119 is all about his love for God’s law. Through Christ we aren’t lawless, just free. Big hugs! Yes, He fulfilled the law for us, in our place! Such profound love He has for us! Hi Edie, as a homeschooling Mama, it is the biggest challenge that I face, to remember that ‘love never fails’, how many times I have fallen short and growled when I should of listened etc!!! How very grateful I am for a faithful God who’s banner over me is love and never EVER ending. Thank you for this post; it was just what my heart and my head needed. Boy! Did I need this!!! Our 7th grade son has 3 f’s right now in school and I have really “lawed” him out! The scripture keeps playing in my head about – fathers, do not exasperate your sons – and man, have I been doing that lately! Thank you for posting this and yes, we are in different places, different families, different paths and different trials, but we, as mothers all have the same heart. This is so beautiful. It’s a moment by moment struggle isn’t it? I was actually up for three hours last night just praying and begging my Father to help me love my sweet boys like this. Edie, you are so honest in your writing. THANK YOU for baring your soul for the greater good. What a blessing. You’re words came at just the time I needed them. My son and I are struggling with certain behavior- his and mine. Oh how I don’t want to force him to behave but to encourage him to make the right choice. Oh it just makes my heart pump, constrict and break all at the same time. This parenting gig is not for wimps, that is for sure. But I feel that there is no higher calling. XOXO to you!! This speaks right to my heart! I’m reading a parenting book like none I’ve read before that speaks about this exactly. “loving your kids on purpose” by Danny Silk. i just adore you, edi! thank you for what you do and say/write! Thank you for sharing the struggles of all mothers. Reminds me of what you said in one of your podcasts about being authenti and not acting like we have it all together. Btw loved your podcasts:) so inspiring. What a powerful image. Often I find one or several gems like this in your writing–words that set off fireworks of resonance and understanding. Thank you for exercising your voice and channeling your heart through your keyboard on topics that speak to women and mothers! I want love and motivating grace to be so much greater than law in my parenting! This is right where I was reading in Galatians last night. God always knows when to reinforce a message he wants to sink in. Good stuff. Thanks! That last paragraph…knowing we are loved…thank you. Oh, how I wish I could have a do-over in some years of my parenting. Why has it taken me so long to understand the gospel? But I am thankful I belong to Him and know I’m loved now. Thank you, Edie! Oh, I know, me too! Edie, I’m not sure how I found your blog — but what a treasure! I laugh at times, cry at times and ALWAYS, always think. Many thanks. Thanks so much for this advice. I have been struggling so much with my strong willed child and trying to make her live up to the expectations I have for her and to fit the mold I have envisioned. It’s exhausting for me and her. i know God has great things planned for her and I must trust in Him! THIS. This is the greatest challenge in parenting….to shower grace and not parent by the law so they’ll just do what they’re supposed to do and make US look good. I’ve made this mistake a thousand times…and a thousand times I’ve apologized and asked God to help me understand his grace more and more so I can give it away to my family. Super thankful for kids who know I love Jesus and want desperately to parent them in His love. Beautiful. 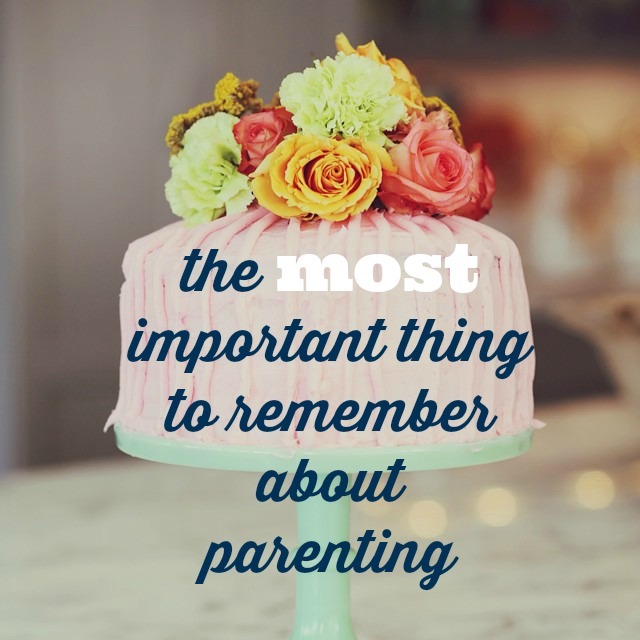 I struggle with parenting with grace and love, rather than being one of those by-the-book parents. Thank you for sharing this and reminding me that love is always the right choice.